As the youngest marcher in the 1965 voting rights march from Selma to Montgomery, Albama, Lynda Blackmon Lowery proved that young adults can be heroes. Jailed nine times before her fifteenth birthday, Lowery fought alongside Martin Luther King, Jr. for the rights of African-Americans. In this memoir, she shows today's young readers what it means to fight nonviolently (even when the police are using violence, as in the Bloody Sunday protest) and how it felt to be part of changing American history. 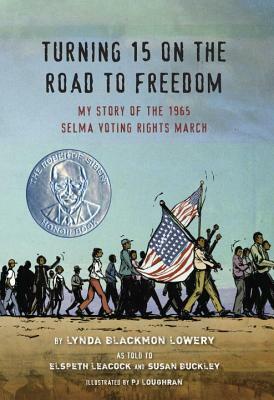 Straightforward and inspiring, this beautifully illustrated memoir brings readers into the middle of the Civil Rights Movement, complementing Common Core classroom learning and bringing history alive for young readers. Lynda Blackmon Lowery, the youngest person to take part in the whole Selma to Montgomery March, now works as a case manager at a mental health center, and still lives in Selma, Alabama. Elspeth Leacock and Susan Buckley have collaborated on several previous history and geography books for young people. Elspeth lives in Brooklyn, New York, and Susan lives in New York City. P J Loughran is an illustrator, creative director, and musician. He lives in Chicago, Illinois.